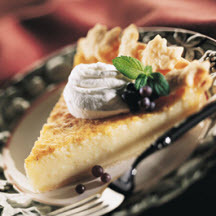 Old-fashioned buttermilk custard pie gets a mascarpone makeover! Recipe by Chef Bill Rowling. Beat eggs in large bowl; add flour and sugar. In separate bowl, combine buttermilk, melted butter, vanilla extract, almond extract, lemon zest and Mascarpone cheese. Add to the egg mixture, beating until smooth. Pour into pie shells; sprinkle tops lightly with nutmeg. Bake for 20 minutes. Reduce heat to 325°F (160°C). Loosely tent pies with foil. Bake for 20 minutes more or until surface is golden brown and center is set. Whip cream to soft peaks; stir in sugar; whip to stiff peaks. Serve atop pie slices. Makes 2 pies or 16 servings.